Starting a series on my thoughts on education, especially the education here in Singapore on which there has been much talk here and elsewhere. There are good and bad comments and views, but mostly the general feel is that studying here is too stressful. When students don’t know how to do their work, is it the parents or teacher’s responsibility to teach them? 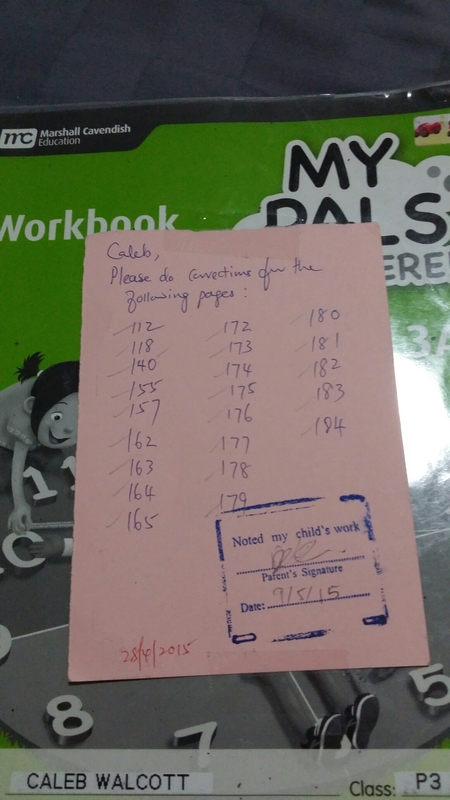 This came out from my frustration in getting multiple text messages from Caleb’s math teacher about him not completing his homework or corrections. Initially I appreciate her letting me know when he didn’t complete his homework. Later on it seemed he got better at remembering to do his homework but he had many corrections to do and he hasn’t been doing them. Of course, one reason he didn’t do them on his own is because he didn’t know how to do the sums. That’s why he got them wrong in the first place. I’m happy to help him and it’s easy for me to teach him because I’m a trained math teacher myself, but it also made me wonder what happens to students whose parents may not be educated or who may not know how to teach them. I asked him before if his teacher goes through the sums with them in class and he says only selected ones. So there may some sums he still didn’t know how to do. Which makes me wonder, when students don’t know their work, shouldn’t it be the teacher’s responsibility to teach them? There was once he was learning a new concept of 3 digits multiplication and he got a whole page of his workbook wrong. I was of course concerned about that seeing that he usually gets most of his sums wrong. I wondered if the teacher was as concerned… It was a good reflection for myself as a teacher to think about what I do when my students don’t understand a concept. The scary thought is that I may not even know when they don’t understand. How do we know? When they fail a test? That incident gave me a new motto in my teaching – to leave no man behind. It made me more conscious about checking if my students understand, and to give extra help to those who don’t. I’m sure there are some who may fall through the cracks though. So I understand that the teacher may not have given much thought or attention to Caleb getting a whole page of sums wrong. But then it doesn’t solve the issue of him not knowing the concept. In Singapore, the tuition culture is HUGE! I mean crazy over the top ginormous ridiculously HUGE. People get in the waiting list to get a spot for their children in the top tuition centres. I myself gave private tuition when I took No Pay Leave for 18 months (so I’m a beneficiary of the tuition system too!). But we don’t believe in sending our kids for tuition. Especially not since we’re both educated people who can coach them ourselves. But should it really fall on our shoulders to coach them in their schoolwork? I never had any tuition growing up and still did pretty well in school. Without coaching from my parents. I do believe it’s possible. And shouldn’t we have faith in our education system and in our teachers? That it’s enough for our kids to go to school and learn what they need to do well? Coming back to the topic at hand, whose responsibility is it to make sure the children learn and understand their schoolwork? Parents or teachers? Or tuition teachers?? From my own work experience, I’ve never ever asked a parent to teach their child before! That just sounds ludicrous. I’m the teacher. It’s my responsibility to teach. Maybe also because I teach secondary school students, I expect them to be responsible for their own work and learning so I don’t ask the parents to make sure they do their work. I just keep them back after school to do their work. And the strange thing is some of them actually are glad to do that! It’s because they get my help in doing their work. I realise sometimes students don’t do homework because they don’t know how. So how? Somebody has to teach them, right? Typical Singapore. Copy the answer, go home, study on your own (or with your tutor), go back to school for a test, score an A1.